Road signs compel you to do all sorts of things, like stopping, yielding, stealing, and boxing up and storing in the garage once you move in with someone as unamused by your stealing as she is by the "No Parking" sign nailed up over your bed. 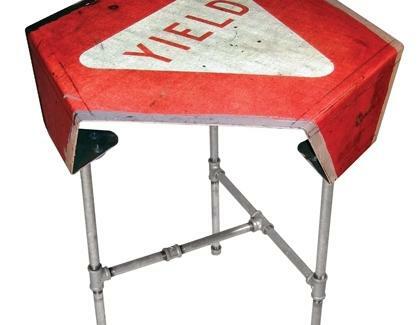 Compelled to make stuff you won't stash out-of-sight, Road Sign Furniture. From an ATX designer recently relocated to LA who's worked for everyone from Tears of Joy Hot Sauce to Walmart, RSF crafts handsome furnishings out of roadside directives responsibly purchased from garage sales and antique shops, bypassing the danger of getting arrested/Falling Rocks. The stock's constantly cycling (and pickings are sometimes slim -- how many garage sales have quality road signs? ), but right now there are bookshelves made from a barely recognizable orange/black directional arrow sign, a yellow arrow job bent into a two-level coffee table (avail for purchase at Yard Dog), and a side table constructed of metal piping and a pedestrian advisory, perfect for those who Do Not Pass driver's ed. 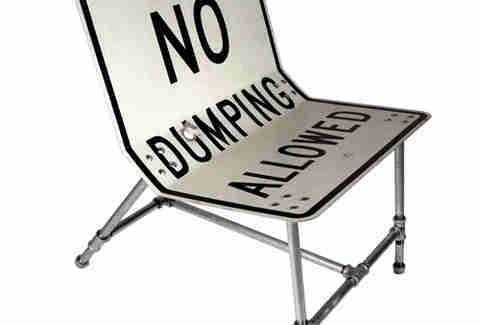 There's also a higher yield triangle sign with the corners folded down and attached to steel supports, as well as a low chair reading "No Dumping Allowed", so if you've ever dated Sisqo, keep on trucking trucking. If you want to contribute to this clearly essential endeavor, the designer's on the lookout for a reliable source of signs -- just make sure you go about it legally, or you'll end up in a place where visits with that special someone always end with someone else yelling "No Touching!"